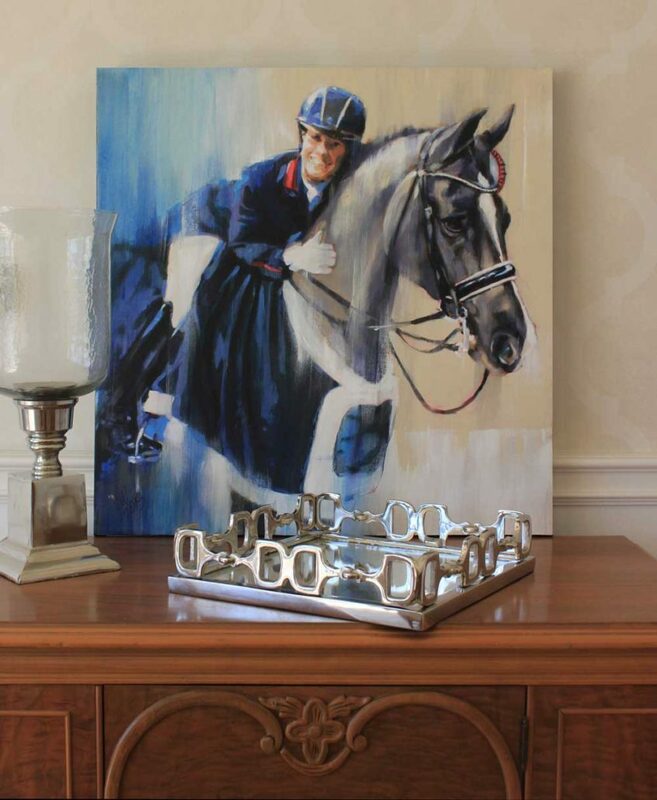 Scott Hayes of SH Productions commissioned a portrait of International dressage duo Charlotte and Valegro aka Blueberry. This piece was based on a friends photo taken right after they won in Amsterdam. Way to go Charlotte and Blueberry!!! As far as I know this piece is on her mantel at home in the UK. Charlotte told us a lot of entertaining stories about Valegro. One of which is that he is often many different colours. Dark, light and blueish grey when hes clipped. I found this “blueberry” color a pretty difficult color to paint… On another note; apparently the year that Valegro came to the barn to start work all the horses got named after fruits. I am lucky I could have been asked to paint apple – would that be red or green? Thank you Scott Hays for this commission work. My first time getting a commission to paint an international dressage star! I loved doing it and actually got my photo taken with Charlotte too. I’ll post that when I get it. Charlotte Dujardin OBE is an elite British dressage rider. Double Gold Medalist at the London 2012 Olympics Games, European Champion, World Champion and holds all three World Records in Dressage. Dujardin and Valegro were selected to represent Great Britain at the London 2012 Olympic Games and in the first round, the team set a new Olympic Record of 83.784%. On 7 August 2012 the pair were members of the team, which won the gold medal in the team dressage event. Two days later, in a routine which included Land of Hope and Glory, The Great Escape and the chimes of Big Ben; the pair won the gold medal in the individual dressage event with a score of 90.089%.